Hello from the edge! After a wonderful marathon of sleep, I am finally set up at base camp in Alaska and working out the kinks in my research. I’m incredibly far up north, to the point where the sun doesn’t set until after 11pm and gets up around 6am – and this is months before the summer solstice. While it might sound annoying to some, it’s actually really useful for fieldwork since we don’t really have a time limit on when it gets dark. Base camp is a…shelter? Cabin? Hut?…about 14 miles north of Nome, the nearest town. We’re right in the middle of the arctic tundra, with a small river running behind the kitchen. I’m told that during the salmon migration we can pull our dinner directly from the water, which means through the month of July I’ll be eating fresh salmon fished right from out of my backyard. Plus, there are beavers! It gets really cold at night though, and our sleeping quarters aren’t insulated. Serves me right for not checking to see if my sleeping bag was equipped for cold temperatures. Nome is a very friendly city once you get to know the people there. They are a little wary of folks from the lower 48 states, as a lot of us apparently come to mine various metals from their land without permission. One man asked me very aggressively if I was here to mine, and became very friendly after I assured him that I was here for the birds instead. Ah, it only took me 200 words to finally get to the birds. The Seward Peninsula is a birder’s paradise. While the numbers of species may not be as high as in the tropics, you get some unbelievable views of them. There are rough-legged hawks, golden eagles, northern harriers, rock and willow ptarmigan, snow buntings, and of course the regal gyrfalcon. 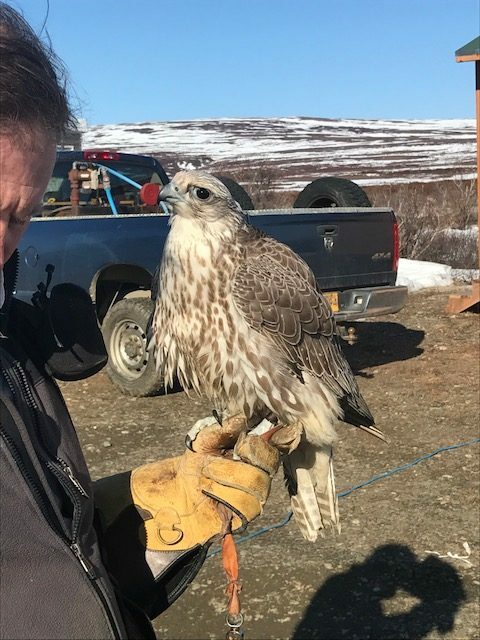 We’re working with a member of the Alaskan Fish and Game Department right now, who has chartered a helicopter to survey the peninsula and locate where all of the raptors are. We should have an idea of where everything is before next week. Our local contact is the Nome District Attorney, who is also a falconer. He got our truck de-winterized and ready for use before we got there, and as a thank you we cooked him dinner. He brought over a beautiful gyrfalcon that he captured and is currently training for falconry purposes, and she ate her dinner along with us. She was extraordinarily well-fed (read: overweight) when she was caught, which means that she is an excellent hunter and a skilled flier. It’s almost sad that she will be released back into the wild in a few months (according to falconry protocols). “That all sounds great,” you say. “But why are you there? Why do you need to know where the raptors are?” Good questions! My scientific focus is on predator/prey interactions and trophic cascades, specifically with raptor species. I came to Yale to study how carnivores impact food webs, and as it turns out gyrfalcons are pretty unique birds that may give me a great look at this topic over the short period of time I have available for my masters research. Tune in whenever I next get a wifi signal to learn more! Over the next few weeks, I’ll talk more about gyrfalcons and why they’re amazing, explain what falconry is and how it works, discuss the theory and research behind trophic cascades and predator/prey interactions, and delve into the history and current activities of my host organization: the Peregrine Fund. This entry was posted in Western Research Fellows, Western Resource Fellows, Wildlife, WRF 2017 and tagged Adam Eichenwald. Bookmark the permalink.